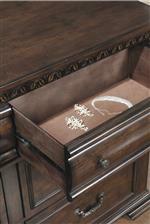 Protect the inside of your drawers from scratches, dents and other marks when they are lined. Opening and closing drawers can cause movement, but the textured surface of felt liners can help eliminate some movement. Drawers are equipped with metal side glides to ensure seamless drawer movement and stability. The glides provide for smooth function as you open and close your drawers, and can support a larger weight capacity. This beautifully designed and detailed chest will give your bedroom some additional convenient storage. The piece is bathed in a wire brushed, warm bourbon finish that pairs elegantly with the exquisitely carved paisley leaf details towards the top. Use the felt-lined top drawer to store your more fragile accessories, while the other four spacious drawers are perfect for clothing. The Satterfield 5 Drawer Chest in Warm Bourbon Finish by Coaster at Standard Furniture in the Birmingham, Huntsville, Hoover, Decatur, Alabaster, Bessemer, AL area. Product availability may vary. Contact us for the most current availability on this product. 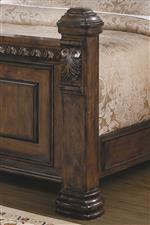 Create a stately, traditional atmosphere with this collection of bedroom furniture. Each piece is tied together through a wire brushed, warm bourbon finish, while expertly carved paisley leaf details provide a beautiful focal point. Albeit traditional in style, the USB cables and power outlet in the nightstand set you up with modern conveniences. The Satterfield collection is a great option if you are looking for Traditional furniture in the Birmingham, Huntsville, Hoover, Decatur, Alabaster, Bessemer, AL area. Browse other items in the Satterfield collection from Standard Furniture in the Birmingham, Huntsville, Hoover, Decatur, Alabaster, Bessemer, AL area.